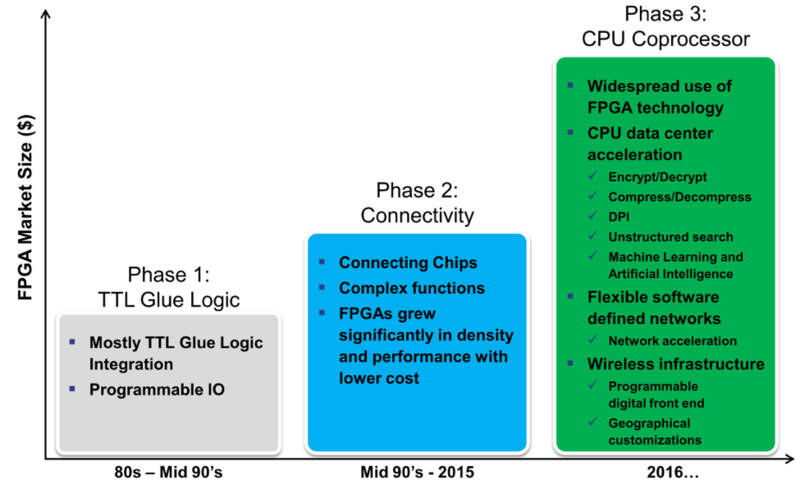 Semiconductor Engineering - Embedded FPGAs Going Mainstream? Semiconductor Engineering - Embedded FPGAs Going Mainstream? Home > System-Level Design > Embedded FPGAs Going Mainstream? Systems on chip have been made with many processing variants ranging from general-purpose CPUs to DSPs, GPUs, and custom processors that are highly optimized for certain tasks. When none of these options provide the necessary performance or consumes too much power, custom hardware takes over. But there is one type of processing element that has rarely been used in a major SoC— the FPGA. Solutions implemented in FPGAs are often faster than any of the instruction-set processors, and in most cases they complete a computation with lower total energy consumption. However, their overall power consumption is higher, and performance is slower than custom hardware. In addition, they use a lot more silicon area because the FPGA is a fixed resource, so enough of it must be put onto a chip for what is believed to be the worst-case usage scenario. The standalone FPGA market currently is dominated by two companies, Xilinx and Altera (Intel). Part of the reason for this is they do not just produce chips. FPGAs require a complex ecosystem to make them useable. This ecosystem is very similar to those required for supporting processors. The transformation from FPGA to eFPGA adds even more complexity to this ecosystem because it requires a customized toolchain for each IP core that is licensed. In the past, several companies have attempted to pioneer the embedded FPGA space, but none have been successful. So what has changed, and is this likely to become a new processor type considered in a growing number of SoCs? To understand why eFPGAs may succeed this time around requires an understanding of both the changes happening across the industry at large and within specific markets. Many markets have relied on the progress of Moore’s Law, which provided smaller, cheaper, faster copies of what had been done in the past, which enabled increasing levels of integration as well as lower power. But much of that has ended. Independent of the intended market, the makers of embedded FPGAs are finding that they are no longer being targeted at low- and moderate-volume applications. “Embedded FPGAs are being integrated into high-volume SoC and MCU chips and will enable new applications and architectures not previously feasible,” says Tate. One area where FPGAs could find a role is in machine learning, which is one of the hot buttons for technology these days. They also could find a role in data centers, where an explosion in data is driving a big effort to reduce the cost of powering and cooling servers. The success of an embedded FPGA will depend on many factors, and the ecosystem that surrounds the product is complex. Consider first that an FPGA IP core is a lot more complex than a memory compiler. Not only do you have to supply the number of logic blocks that you may want, but the amount of memory, the form factor, the number of type of embedded hard cores, such as DSPs, as well as factors such as the technology node that you want the IP delivered in. That requires a complex tool suite, including all of the models and views necessary for the integration. Then the integrator of the core has to be able to program the FPGA. The standalone FPGA vendors invest just as much in that toolchain as they do in the hardware itself. It requires logic synthesis engines, place and route, Design for Test (DFT) methodologies, timing engines and a lot more. Each of these tools chains is custom for the core that has been created. An extra layer of complication is added if the end customer of the chip that contains the embedded FPGA is also to be allowed to reprogram it. And that is always another possibility. With the rapid costs declines in 2.5D integration, and with the FPGA vendors having proven to be technology leaders in this area, they could come out with their own solutions without some of the headaches. As the number of interconnected devices increases, technology challenges grow.